Are there large planets beyond Neptune? At the moment there are 8 known planets in the solar system (alas, poor Pluto) and (officially) 5 dwarf planets. With the exception of Ceres, the dwarf planets are all trans-Neptunian objects. 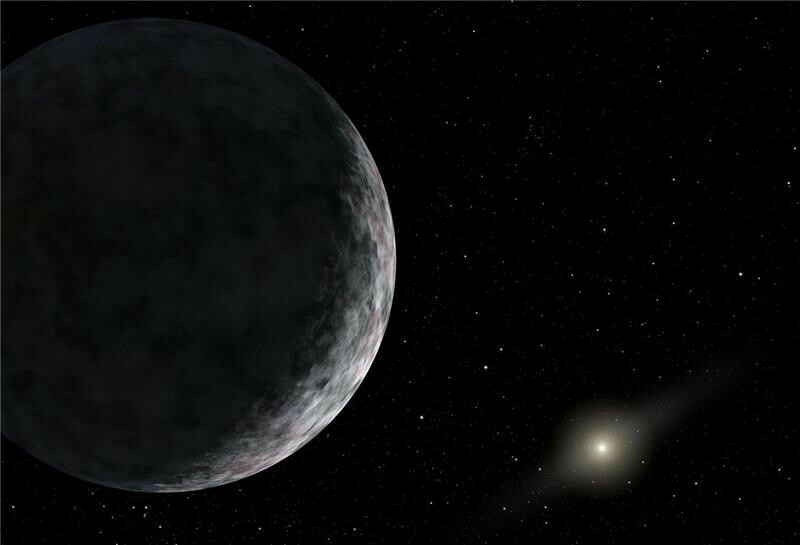 We know of several other such objects of similar size, but these haven’t yet been designated as dwarf planets. But what about larger bodies on the edge of our solar system? At the moment, we know of nothing larger than Eris beyond the orbit of Neptune, but a recent paper in MNRAS hints at the possibility of larger trans-Neptunian planets. The paper looks at the orbits of 13 trans-Neptunian objects and notices an interesting pattern. According to current models, these small distant bodies should fairly close to the invariable plane of the solar system (where most planetary orbits are) and they should have an average orbital distance (semi-major axis) of about 150 AU (astronomical units). What the team found was that the bodies have a semi-major axis of 150 – 520 AU, and their orbits can tilt 20 degrees or more from the invariable plane. So the team looked at gravitational simulations of these orbits, to see how they might be affected by larger gravitational bodies. In particular, they looked at in interaction known as the Kozai mechanism, where the gravity of a larger body can pull the orbit of a smaller one toward the orbital plane of the larger one at the cost of making orbits less circular. They found that the orbits of these trans-Neptunian objects could be explained by the presence of one or two larger bodies in the region. Their results suggest super-Earth massed bodies in the region of 250 AU. This wouldn’t be the first time a new planet has been discovered by its gravitational influence, though it should be stressed that the evidence here is not particularly strong. Thirteen bodies is a small statistical sample, so don’t bet on a large planet beyond Neptune just yet. But the hint is definitely there, and we are bound to find more objects waiting in the dark as our detection methods continue to improve. Just had an idea thinking back retrospectively on the latter. Would two close concentric rings of a dynamo in weightlessness with the inner one spinning, produce enough energy with a surplus? Would the repulsive magnetism of separate permanent and non electromagnetic magnets needed to stop both the rings touching cause friction in itself to stop the inner ring turning?